Henry Wellcome was born in Philadelphia in the U.S.A. in 1853 and came to London in 1880. He made his fortune as a pharmaceutical entrepreneur and founded the Wellcome Trust in London which funds medical research. He was also an obsessive collector of things medical and his collection is wide-ranging, not to say eccentric, and includes a number of objects only tenuously connected with medicine. 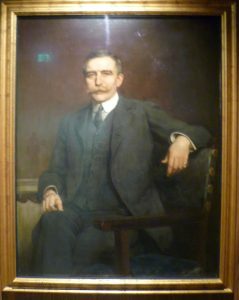 Sir Henry Wellcome (1863-1936) by Hugh Goldwin Rivière. Born in America. Took British nationality in 1910. F.R.S. and knighted 1932. Some early photographs of him in America show him with what looks like a travelling Cabinet of Curiosities and, certainly, this is impression one gets from the Wellcome Trust’s historical collection in London. In this post I’m looking at some of the many curious objects which I found interesting. For example, this extraordinary ram’s head snuff box from Edinburgh, called a snuff mull. Snuff is powdered tobacco; you take a pinch and sniff it delicately up one nostril. There’s an art to this – it’s all too easy to take too much and go into a sneezing fit. 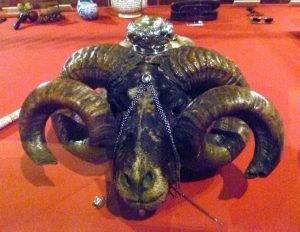 The Science Museum tells us that the ram was probably once a regimental mascot and, after its death, its head was stuffed with a silver snuff box placed on top; it was then put on wheels, and trundled round the mess table for officers to take a pinch. My next object is an 18th century posset cup. Posset cups have been described as a cross between a teapot and a biscuit jar but this one has lost its lid, which is a shame. 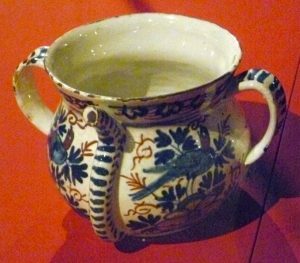 A posset was a hot, often milky, medicinal drink and the patient held it by the handles and drank from the little spout. Georgette Heyer fans will remember that, towards the end of The Grand Sophy, Eugenia Wraxham, the hero’s tiresome fiancée, ‘desired to be conducted to the kitchen, where she proposed to brew a posset, used in her family for generations as a cure for colds’ to give to Lord Bromford, who had caught a cold whilst riding in the rain. I reminded me of one of those cups with little spouts for babies who want to drink by themselves. It still makes a mess but less than it would if it were spoutless. I’ve often wondered what, exactly, a posset cup looked like, so I was delighted to see this one. The 1933 Everest Expedition was the first one after the 1924 expedition in which George Mallory lost his life. It was to be eight years before the Dalai Lama gave permission for another attempt on the mountain. The British knew that the Germans were planning an assault on Everest, so time was off the essence. But the 1933 attempt failed as well. Everest wasn’t conquered until 1953. I was brought up with the story of Scott’s Last Expedition, the Terra Nova. This was a race to the south pole between Britain and Norway which the Norwegian team under Roald Amundsen won. All five members of the British team perished on the way back, due to lack of food and appalling weather. Their bodies were discovered eight months later. When I was a child, I wrote to Frank Debenham, geologist and cartographer on the Terra Nova expedition, and later Director of the Scott Polar Research Institute in Cambridge, about his book In the Antarctic, and I was thrilled when he answered my letter. 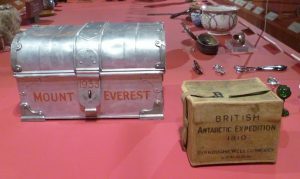 So it was a special thrill to see the battered medicine box from Scott’s last expedition. Bleeding, or cupping, was a long-held medical practice. It was believed that the four ‘humours’: earth, air, water and fire needed to be kept in balance and that a fever was obviously caused by too much fire – the hot element. The idea was to let out excess blood from a vein and thus restore the body’s balance, especially in the case of fever. Unfortunately, over-bleeding managed to kill a large number of people, including Lord Byron. 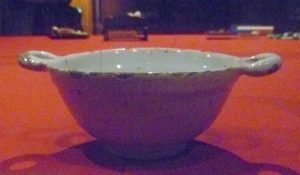 I was interested to see this bowl. It is big enough to hold a pint of blood – with space in case of spillage. The Collection has three of these and none of them are either labelled or dated. I think it’s a retort, a glass vessel once used in medieval alchemy. In a modern chemistry laboratory, it is still used for distillation. The liquid to be distilled is poured into the retort and heated. The vapour condenses and drips out down the long bend in the neck. I doubt whether this retort is medieval, but I liked its shape. And I’d really like to know how you make a retort. 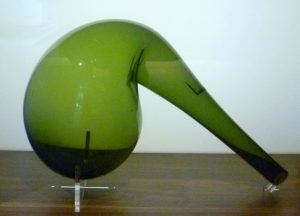 It seems too difficult a shape to glass blow. My last object is this brass corset. 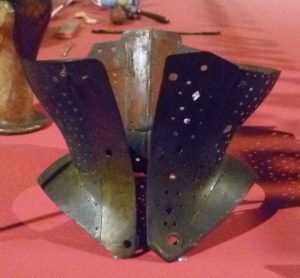 I’d never seen such a thing before – whalebone, yes, but not metal. It’s horrific! Heaven knows what it did to one’s digestive organs, or, womb, for that matter. Why on earth would a woman wear it? The Wellcome Collection doesn’t know either but it offers the suggestion that it might support a bad back. (Surely not!) Apparently, many women liked wearing a corset as it gave them a fashionable hour-glass figure. I remember my mother lamenting the demise of the roll-on, that rubbery corset with suspenders, which became obsolete when tights came in, in the 1960s. She complained that tights did not hold your tummy in in the same way. All the same, a brass corset does seem to me to be extreme. Absolutely wonderful. Soooo pleased to see the posset cup. Lovely thing too. I have saved that to my Pinterest board for Accessories Past. As for the brass corset – help! A punishing object. Can’t imagine anyone being able to move in the thing. As for the rubber foll-on, I remember my mother wearing one of those. In fact, I’m not sure I didn’t wear one myself in my late teens – once or twice. Or it may have been similar in heavy elastic rather than rubber. But my mum definitely had a rubber one and wore it a lot. Sounds like that museum is well worth a visit. Thank you, Elizabeth. I don’t think you were meant to move in the corset; it was like the Cuirass bodice;- it kept you physically – and morally – upright. And it would certainly deter a would-be seducer! A wonderful collection of objects! Thank you for this fascinating blog. Yes, a little more interpretation and an indication of provenance would be reassuring. I wondered what the elephant shaped glass objects were too but couldn’t find anything to tell me. The Ram’s head shows that someone had a proper sense of drama! Thank you for this, Tamsin. Re: the retort – I vaguely remembered the name from a book about alchemy, so I googled it, and that’s what it was. As for the ram’s head snuff box with those splendid horns, well, that’s a Scottish regiment for you! They do things in style. 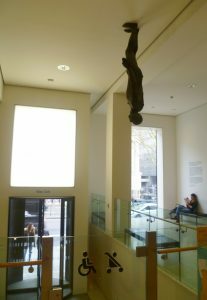 My memory of the Wellcome Collection is that it has a plethora of rather grisly objects. I liked the ones you chose to show us which were not disturbing at all – well except for the metal corset which looks punitive.